Hoop earrings are circular, semi-circular or oval-shaped earrings that are typically made of thin gold or silver-plated metal tubing formed to resemble a hoop that is worn through a piercing in the earlobe and secured in the back. Hoop earrings range greatly in size, from small and discrete to large and pronounced (hoops can be so large they even brush the tops of the shoulders). While classic hoop earrings feature an almost minimalist simplicity of design, some contemporary hoop earrings may incorporate other decorative elements and embellishments, such as beads (or fringe) strung around the hoop, or dangles that hang from the bottom of the hoop. 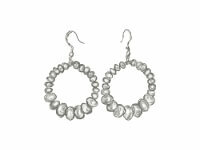 Some dangle earrings made from other materials, but fashioned to resemble a large open hoop, may also be commonly referred to as hoop earrings. While we do not “yet” offer any beading patterns that teach how to make basic metal hoop earrings, we do offer several beading patterns that teach how to make beaded hoop earrings in several fun styles. If you can’t find instructions on how to make hoop earrings in the style you want, don’t hesitate to submit a suggestion for a hoop earring pattern. We’re constantly working on new DIY earring styles and designs and always appreciate hearing what type of beaded earrings you want to make. Also, make sure to check back often, or subscribe to our newsletter so you’ll be notified of fun new beaded earring tutorials as they’re released.